I ran into a scenario recently where two companies had been sharing the same Office365 Exchange tenant for >2 years, one of the two companies was now big enough to warrant its own Exchange online instance, however the two companies still needed to be able to seamlessly contact one another [Lync(Skype For Business)/Exchange Mail/Share Calendars/etc]. We could easily share calendar information between 365 accounts, however the problem of “finding” a user in the sister-company became an issue; How does a user in “company A” find a user in “company B” if they don’t know them before hand? By splitting user out of the original Office 365 tenant they loose visibility to search for people in the Global Address List (GAL) to look-up job titles/user locations/phone-numbers etc (This was desired). 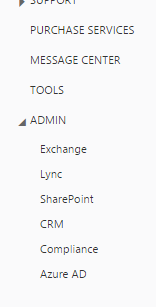 One option was to create contact objects in “Company A’s” active directory for users in “Company B” (and vice-versa) and have these sync to Office 365 via Directory Sync… Good-idea, however this is manual and is not a function of Office 365 “out of the box”. …It turned out this problem wasn’t tremendously hard to solve with the improvements that Microsoft have recently made to Office 365, specifically around the ability to access and [now] query the Azure Active Directory that comes with Office 365 with the Graph API. The concept is fairly trivial really – Each company delegates Read-Only access to their Azure active directory to a custom application; this is no different to allowing a Standard Application for something like Jira (from Atlassian) access to your Active Directory in Azure for authentication… The corresponding company cannot retrieve anything other than standard AD attributes nor can they attempt to authenticate as you (Allowing read-only access will generate a certificate that can be exchanged to the other company; and can be revoked at any time). Once each company has established application access to their AzureAD Instance, the relevant details are exchanged and loaded into the ADCST tool. Now, when the application is invoked user objects from Company A that were previously synced to Office365/AzureAD via Directory Sync are retrieved as objects by ADCST. They are then added to Company B’s on-premise Active Directory as contact objects and synced to their instance of Office365 to later appear in the GAL. If a user was to leave Company A and their account to be deleted, the corresponding contact object will be removed Company B’s GAL. Objects will only be created in a Target OU as specified in configuration. Once tha Azure Portal loads, Click on Active Directory in the left hand nav. Click the directory tenant where you wish to register the sample application. In the drawer, click Add. Click “Add an application my organization is developing”. Enter a friendly name for the application, for example “Contoso ADCST”, select “Web Application and/or Web API“, and click next. For the App ID URI, enter “http://localhost”. Click the checkmark to complete the initial configuration. While still in the Azure portal, click the Configure tab of your application. Find the Client ID value and copy it aside, you will need this later when configuring your application. Under the Keys section, select either a 1-year or 2-year key – the keyValue will be displayed after you save the configuration at the end – it will be displayed, and you should save this to a secure location. NOTE: The key value is only displayed once, and you will not be able to retrieve it later. Configure Permissions – under the “Permissions to other applications” section, you will configure permissions to access the Graph (Windows Azure Active Directory). For “Windows Azure Active Directory” under the first permission column (Application Permission:1″), select “Read directory data”. Notes: this configures the App to use OAuth Client Credentials, and have Read access permissions for the application. Select the Save button at the bottom of the screen – upon successful configuration, your Key value should now be displayed – please copy and store this value in a secure location. You will need to update the ADCST.exe.config of ADCST with the updated values. AzureADUserGroup = This group contains all of the user accounts in the Remove Azure AD that you with to pull into your Active Directory on-prem as contact objects. Create a Scheduled task to call the ADCST executable on a regular basis as the Service Account that you just created. The above implementation certainly wont appeal to everybody, and it could be argued that this is a specific edge-case, but it appears to do the job nicely for what was required. Let me know if you have any thoughts or suggestions. The fine print: The use of this software is at your own risk – No warrantee is expressed or implied. ADCST will now Sync nominated Group’s to Active Directory as contact Objects (I want to change this to normal Group objects with members expanded from source groups). (Synced Group [Distinguished name] destination defined using the “GroupsDestinationOUDN” App.Config Value + Source Group defined using AzureADGroupsGroup App.Config Value). Users that are synced are now added to a nominated security group – This can be used to lock down groups/resources in Exchange to Internal users as well as contact objects contained in this new security group to prevent spam. (Group [distinguished named] defined using the “PermittedSendersGroupDN” App.Config Value). This entry was posted in Active Directory, Azure, C#, Cloud, Development, Office 365. Bookmark the permalink. Awesome tool, thanks! I’ve forked it to get it to recurse through sub groups. 2017-03-21 15:25:52.9860 | UTC: 2017-03-21 15:25:52.9860 | ERROR | 1 | Error when Creating user contact A constraint violation occurred. I get a few of those, but not many. Any suggestions would be awesome. Thanks for the tool. Hi Robert sorry for the late reply. This usually means that the account you’re trying to create is missing something or has something that cant be used when creating a contact object. Is there anything special about the user its being based off – perhaps its missing a property that AD On-prem requires? Would this work btw an on-prem exchange (company A) and office 365 hosted exchange (customer B) ? This would certainly work from Customer B to Company A as the application retrieves user information and creates contacts by fetching them from an API that Microsoft expose for Azure Active Directory. 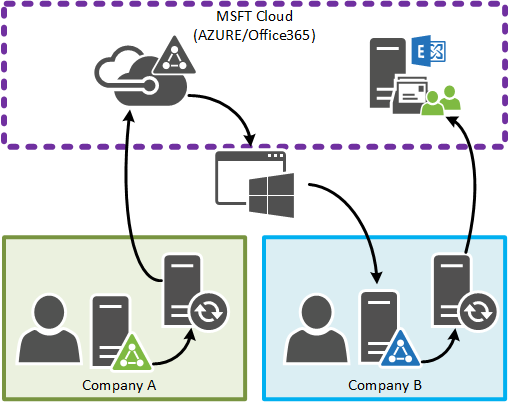 The inverse could be achieved by getting Azure Active Directory and syncing your on-prem AD to Azure Active Directory – This could still be accomplished without ditching your on-prem exchange. You could sign up for office 365 (pay for one user only which will give you Azure AD) and install Directory Sync to push user information to Azure AD then use ADSCT to sync from Company A to customer B. Please let me know if you have any further questions – Hope this helps. 2. When updating a users address (city is specific field we care about), it doesnt seem to be enough to update the contact. We need to delete and resync for the change to take effect. But that causes even bigger issues with sending them emails (as they are a new object. 3. the option to create them as a mail-enabled contact would be huge. i currently run a script to update the users, but if this was possible with the app it would be great. You’re right – this project needs some love. I’m going to kick off a new version of this tonight and try incorporate your changes. I do have a branch of the existing code base that creates mail enabled users (so that we can grab their photo from Office365) – The mail enabled users are unable to login, they are effectivly disabled , would you agree that’s the right approach? I love the idea of you adding some development to this; I too have a need for some of the changes you are proposing to make to the project. Do you have any general idea what your time frame is? I need to sync a few thousand users between 2 companies with disparate O365 tenants as part of a merger and would love to incorporate your latest efforts into the planned close of the deal in early October. I’m still chipping away at it in my spare time so its a little way aways yet – it is looking good however. Excellent tool, saved me a lot of headaches! Successfully configured to sync between 3 Tenants, running two instances on each on-premise AD. Agree with previous comments with regards to additional attributes, telephone numbers would be a real bonus. Also, I had the “Error when Creating user contact A constraint violation occurred” and after some investigation found that removing the country code from the object allowed it to sync without error. To debug I had to manually find what contacts were missing – would be useful if the error log identified what object it failed on. Could we commission your work to provide a solution to our need? We have multiple 365 tenants that need their GALs synchronized. What are you able to do for us? Should be able to help you out – want me to email you directly?